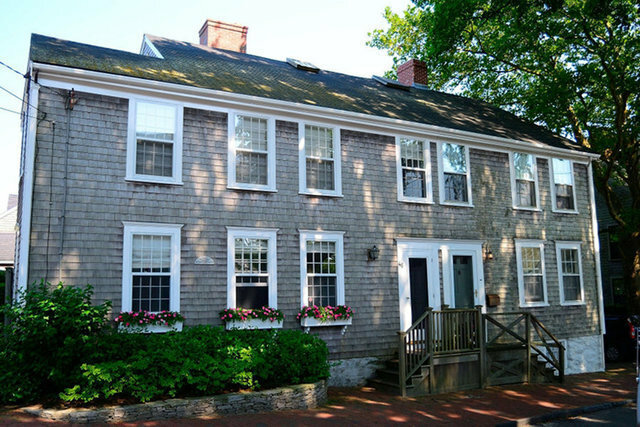 The home at 46 Fair Street was built in 1797 by shipwright Benjamin Austin and yeoman Jonathan Coffin. 46 and 48 Fair share a dividing wall, a common construction practice during this period. Each address is a separately-deeded property. The current owners completely rebuilt the structure in 2008 with four finished living levels, new foundation, plumbing, wiring, chimney, four fireplaces with granite hearths and surrounds, spray-foam insulation, and an entirely new interior. Raised panels, wide-plank heart pine floors, crown and baseboard moulding, large closets, and tiled bathrooms provide elegant finishes throughout the house. The kitchen and bathrooms incorporate elegant fixtures and recessed lighting. Central heating and air-conditioning use the most fuel-efficient systems. The first floor opens onto a spacious entry, living room, reading nook, half-bath, dining room, and kitchen, all of which are wrapped around a central chimney. The second floor includes two queen bedroom suites separated by a long hallway and the chimney for maximum privacy. One bath includes a steam shower, while the other has a spa tub and shower. The third floor, currently set up as a children’s sleeping area, also includes extensive built-in storage and could easily be made into a study. The lower level, with French cobble floors, includes a den, laundry area, mechanical room, extensive storage, wine cabinet, and four additional drawers of refrigeration. The house has built-in security and temperature control systems that are centrally monitored, and separate climate controls for each of the four finished living levels.